Exit Technologies came to us once before to help clean up their website. The first time they had 10,000 pages due to using outdated SEO techniques to target keywords by making duplicate pages and only changing the target keywords en masse. We helped them clean up that mess and sent them on their way with only about 100 pages, only for them to come back months later with almost 1,000 pages and even worse code! In order to tackle the SEO issues and track them properly we had to fix some first, then get them in our system. 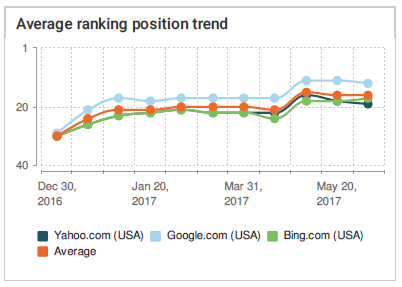 Unfortunately we do not have records of the SEO before the new site launch, so this is what it was like after the new site launch when rankings started improving. From there we spent the next few months cleaning house! We improved the website substantially for user experience, eliminated all duplicate content and restructured the site to be more effective. From December 30 to mid January the average ranking position for all keywords of the site went from 29 to 17. This is the average results of all keywords combined across the site, so it is generally very hard to make big jumps like this unless there are major issues impeding what could otherwise be high-value SEO across the site. Gains like this are only possible when you have a solid underlying foundation! We continue to work with Exit Technologies today to further their online presence!